Carbon Dioxide « Global Market Insights, Inc.
Lifeline’s recent launch of the latest edition of Zero 3620 fire suppression system marks another lucrative journey for the car safety giant in fire suppression industry. Post the gala success of its patent Zero 3620 fire suppression series, Lifeline, somewhere toward the end of 2016, introduced Zero 3620 Firemarshal, reported to be the advanced version of the original system. As claimed by the experts, this state-of-the-art fire suppression technology not only offers outstanding performance but also scores a competitive advantage with regards to its cost when compared with other FIA 8865 approved series. In addition to this, Zero 3620 Firemarshal also meets all the revised fire suppression standards of FIA 8865 and has been especially designed to be used with diesel, unleaded petrol, and E85 fuels, cite reliable sources. Thriving on the foundation of the escalating requirement of fire safety in commercial and industrial sectors, which has pushed leading companies to diversify their product portfolio, fire suppression industry size is certain to widen its horizon in the coming years. 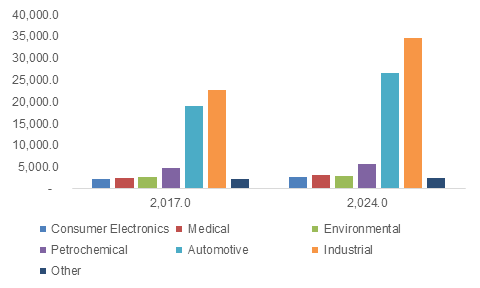 As reported by Global Market Insights, Inc., fire suppression market size will exceed a valuation of USD 16 billion by 2024, with the overall target annual installation to surpass 500 million units by 2024. Tremendous increase in the number of fire accidents and hazards over the last couple of years across the globe is stupendously driving fire suppression market size. Validating this crucial fact- International Rescue Services in one of the latest reports estimated that over 60000 injuries and 20000 casualties were recorded in the year 2014, due to fire. Considering these compelling issues, stringent government norms have been mandated on workers associated with mining and petrochemicals sectors to maintain occupational safety and control loss of property, which again has proved to be a major driver for the global fire suppression market outlook. The U.S. government, for instance, has established NFPA (National Fire Protection Association) codes and protocols for the standardization of equipment and protection systems across the country. Undoubtedly, it has brought remarkable proceeds in the regional fire suppression market trends. U.S. is one of those fire-accident prone regions where the record is noticeably high. In fact, National Fire Protection Association, in its latest report, stated that in the year 2015, America accounted for almost 1,345,500 fire accidents. Strong positive outlook toward building safety codes along with growing incidence of fire hazards is expected to stimulate the product penetration in this country. 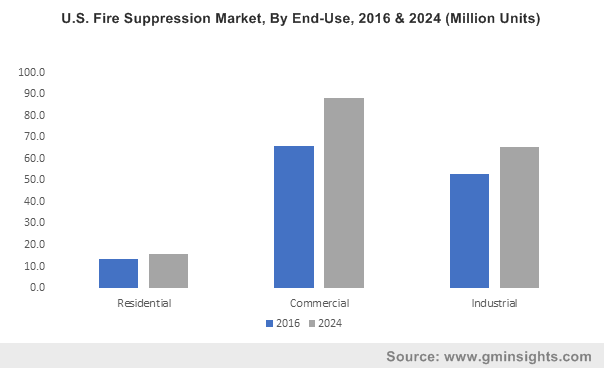 If experts’ estimations are to be relied on, U.S. fire suppression industry is anticipated to exceed an annual installation of 150 million units in the coming seven years. Europe is also claimed to be another lucrative ground for fire suppression market growth, with U.K at its foray. In fact, U.K fire suppression industry, is estimated to witness a y-o-y growth of 3% over 2017-2024. Spreading awareness among the Europeans with regards to increasing adoption of fire protection system has fostered the regional market proliferation. Additionally, the European Commission estimates that approximately over 70000 people get hospitalized every year from fire hazards with a subsequent damage of almost USD 148.6 billion. Unfortunately, the percentage is increasing day by day, which proves to be a significant contributing factor contributing to the regional fire suppression market share. The British government in this regard, has taken substantial steps toward the development of workplace safety especially across residential and commercial sectors. For Instance, The BAFSA (British Automatic Fire Sprinkler Association) deals with building codes that standardize the installation, design, and sprinklers in residential complexes of U.K. The British government has also mandated that the premises with heavy electrical equipment should have installations of 5kg CO2 extinguisher. For fire suppression industry players, this is a vital factor to be taken into consideration. Global fire suppression market is characterized by the participation of some of the renowned biggies like TYCO, Amerex Corporation, United Technologies Corporation, National Fire Equipment Ltd., SFFECO, Minimax, and Master Fire Preventions Ltd. These giants are increasingly focusing on product innovations which are endowed with advanced technological affluences. For instance, Tyco, in the year 2015, introduced a novel ESFR pendent sprinkler for storage and warehouse application with an objective to strengthen its business position in the competitive landscape. Looking at the incessant effort taken by the leading companies toward the upgradation of their product portfolios along with consumers’ growing awareness toward fire safety, it is undeniable that fire suppression industry would profoundly enhance its profitability landscape over the forthcoming years. This entry was posted in HVAC and Construction and tagged Carbon Dioxide, Dry Chemical, Fire Extinguisher, Fire Protection Market, Fire Protection Systems Market, Fire Sprinkler, Fire Suppression Industry Analysis, Fire Suppression Industry Trends, Fire Suppression Market, Fire Suppression Market Size, Fire Suppression Systems Market, Foam.